Admit it, maybe you’ve thought about cooking hot meals for your dog. It’s okay, you’re not alone as you stare into your dog’s dry kibble bag again and wonder, “Doesn’t she get bored of this stuff?” (My black Lab is but a one-dog sample size, but her mealtime behavior indicates that no, she is not yet sick of the kibble.) 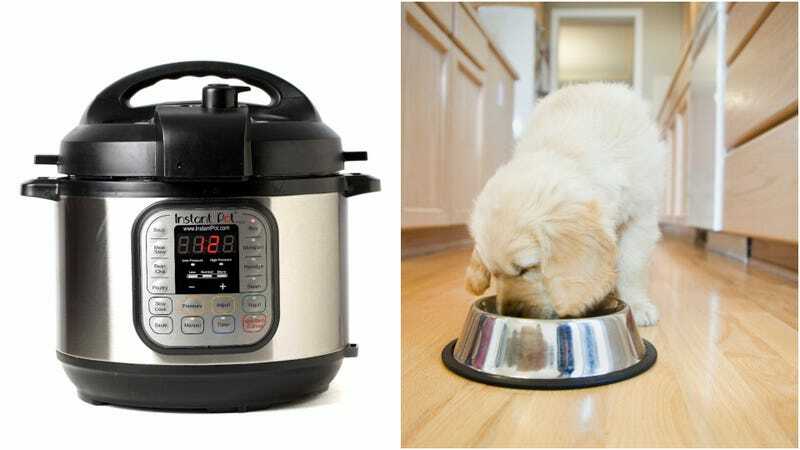 For more discerning doggies, however, a new gourmet option will debut October 1 when a pet food company called YaDoggie plans to launch the first dog meals designed specifically to be prepared in an InstantPot. TechCrunch reports the 20-minute YaDoggie Fresh meals are made of “human-grade” ingredients and come in grain-free turkey and salmon options. YaDoggie bills the Fresh food as “meal kits... so healthy, you could eat it too. No, but seriously.” The project is still currently in its IndieGogo crowdfunding stage, and has a month left to reach its $30,000 goal. Like the rest of YaDoggie’s offerings, these InstantPot meals are delivered to your door as part of a subscription model; you can choose to feed your dog solely those meals or use the Fresh meal kits as a mix-in to your dog’s kibble. Back the Indiegogo at the $45 level and your dog could receive two bags of YaDoggie Fresh, two bags of YaDoggie jerky treats, and an Instant Pot-compatible liner, lid, and sealing ring—presumably so the dog’s food isn’t cooked in the same Instant Pot liner as your food. Even though, please remember, you could totally eat the dog food!